The Concord Company is the wholesale dealer of trailer axle and truck parts. 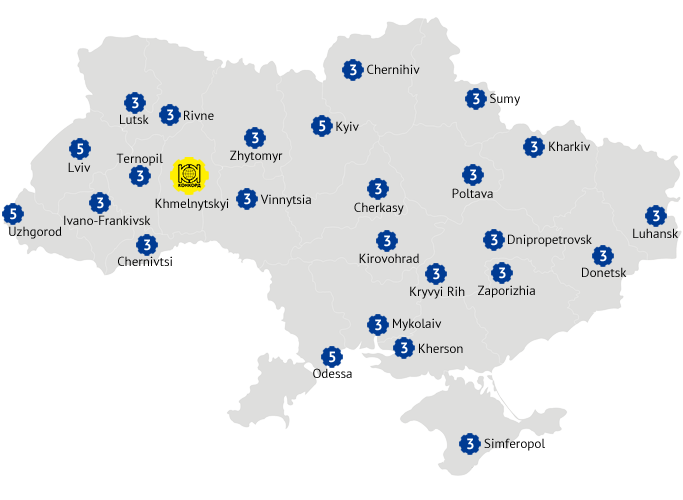 We supply spare parts to all regions of Ukraine. In our product range there are air-springs, leaf-springs, shock absorbers, suspension parts, brake disks, drums, pads and shoes, filters, chassis parts, oil seals, lamps, mirrors, accessories and so on. Today our wholesale network covers all Ukraine and amounts 280 clients including auto-services, heavy and small wholesale buyers. Our sale strategy is built on dealers and wholesale clients who have their own buyer networks in the regions. Today Concord company cooperates with 80 large dealers. At least 3 dealers are present in every regional center of Ukraine. On our web-site there is placed the update of assortment of production of company Auger for November 2010. SAF-HOLLAND Offers new repair kits for wheel hubs Integral (the first version) and Integral (06 - New generation). - In cases of a deviation of the guarantee demand (guarantee). Meritor Cup - thousands prizes wait for you! And a chance to be present on semi-final of the World championship of football on July, 6th 2010 in Cape Town.